All right, my friends, i'm going to try to acquaint you with the enormity of your error if you were not present at the concert last Sunday (November 16, 2008) by the Mission City Hot Rhythm Cats, who played at the Capital City Comedy Club in Austin, Texas, as part of the series of traditional jazz concerts hosted by the Austin Traditional Jazz Society. The band's website is at http://missioncityjazz.com/. To do this, i'm going to have to resort to analogies, which are always suspect, but frequently the only way to give person B an idea of what person A knows about. For example, say you saw an elephant, but your friend has only ever seen a mouse. Yes, you could tell him that both animals are grey, have a nose and a tail, are rather round in shape, and the elephant is bigger, but that really doesn't do it, does it? Well, the Mission City Hot Rhythm Cats (hereinafter abbreviated to MCHRC) are kind of like elephants. Didn't work, did it? Let me try again. Everybody has some musician friends who play instruments, and sometimes enough critical mass of players is achieved, with the right instrumentation, to allow them to put together a band, which is mainly just for kicks and plays at local events for no money. Eventually they may get good enough to attach a name to their group, and maybe get a gig at a local bar or restaurant. After a while, they start to get better known around the city, attract a following, and are mentioned in the newspaper. In time, they start playing in other cities in the area and then the region, and then the state. If they are really very good, after a while they begin to garner attention nationally, and perhaps go on tour or get paid to appear at jazz festivals in other states. And after a number of years doing this, they go on tour internationally, and after decades become an icon, an exemplar of a style of music. So, seen this way, bands may be regarded as a 'friends' band, then local, neighborhood, city, area, regional, statewide, national, international, and timeless. The band's personnel is as follows: David Jellema (co-leader, cornet, clarinet), Mike Pittsley (co-leader, trombone), Pierre Poree (clarinet, alto saxophone, vocals), Mark Hess (piano), Tim Paco (bass), and Ed Torres (drums). David Jellema (cornet, clarinet) played with traditional-jazz bands in the Washington DC area from age 13: Southern Comfort, Buck Creek, Storyville Seven, Last Chance Jazz Band, Bay City Seven, Federal Jazz Commission, and the New Traditonal Jazz Band. He also has a BA in Classical Civilizations and has worked in Egypt with Horn of Plenty refugees and in northern Iraq and southeastern Turkey with Kurdish refugees. Mike Pittsley (trombone) grew up in northern California and in 1978 joined the Jim Cullum Jazz Band, appearing in over 100 broadcasts of Riverwalk, Live from the Landing, as well as playing on many Cullum CDs over the years. 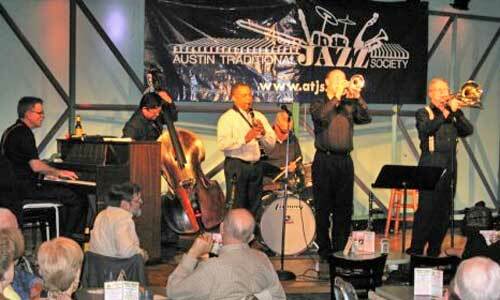 He teaches low brass in the San Antonio area and also holds a commercial aircraft pilot's license. Eddie Torres (drums) also played with the Cullum band (1984-2000), and is a devoted fan of Gene Krupa and Zutty Singleton. Mark Hess (piano) is another Cullum alumnus (hear him play trombone on the Happy Jazz LPs of "Happy Landing" and "Listen Some More"), and also in 1975 won the prestigious Texas Ragtime Championship. Pierre Poree (alto sax, clarinet, vocals) hails from New Orleans, but he relocated to San Antonio to escape hurricane Katrina. In New Orleans he played and sang regularly with local bands, and has continued doing so in San Antonio, where he is also a music educator. Tim Paco (string bass) is a San Antonio native who worked for years in New Orleans, and has played bass, tuba, and sousaphone there with Pete Fountain, Connie Jones, Bob Havens, Tim Laughlin, and Matt Perrine among others.